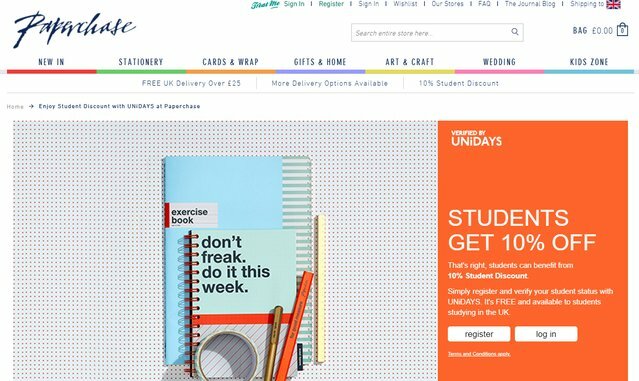 Looking for a Paperchase student discount? Excellent news, we can confirm there is a Paperchase student discount code to get 10% off at paperchase.co.uk valid in 2019. To get it verify your student status and you’ll be issued with a discount code to get the reduction. Their gift ranges change seasonally and are all aesthetically matching, so when you find one you like, stock up and get everything matching! You can find Paperchase online, in bricks-and-mortar high street shops and in concessions in some Selfridges and House of Fraser department stores. What really sets Paperchase aside from its high street competitors is its design. There’s something for everyone, and you’ll find fun, funky, flirty and classic designs on products from the Paperchase ranges. Most standalone collections are only available for a limited time, so supply can often be outweighed by demand and collectors must search further afield to get hold of the pieces they want. Taking a design-led approach to its products rather than a ‘basics’ stance has really made Paperchase stand out in the market, and made it a real ‘one-stop-shop’ for people’s stationery and gifting needs. Named as Britain’s number 1 brand for innovative and design-led stationery, Paperchase’s products have definitely caught people’s imagination. Paperchase’s range consists of two main sections: the Essentials, which are tried and tested regular products favoured by customers and always available, and Innovation Ranges, launched weekly and available for set periods of time, created by in-house design teams. This love of design has found international appeal, with shops now appearing in major cities in Ireland, the Netherlands, Denmark, France, Germany, and the United Arab Emirates, as well as over 130 in the UK. There’s no need to worry if you don’t have a Paperchase by you though; their website offers a whole host of web-exclusive products and ranges that you simply won’t find in store! Delivery is free on all orders over £25, or you can ‘click and collect’ for free, so you won’t miss out either by having a shop near you or not. As standard, Paperchase offers a 10% student discount through UniDAYS, but this varies with sales and promotional events throughout the year. In order to find the best bargains and most up-to-date offers and discount codes, you’re best to check back here, with Student Discount Squirrel. Whether its staples, signage, sheet wrap or single greetings cards, we’ll find you a student special and make sure you snap up a steal! Anyone who’s shopped in Paperchase before won’t be surprised to hear that it was founded by two art students! Judith Cash and Eddie Pond launched the brand in 1968 but quickly sold it on, and the chain changed hands several times, including taking on large investment from now-competitor WH Smith. Owned by Borders, it was swiftly sold off when the bookstore went into administration, and now sits owned by Primary Capital, an investment fund. With over 130 stores in the UK and several concessions, Paperchase has long been a firm favourite on the high street and continues to grow into more affluent towns and cities, as well as university towns with high student populations – but its appeal spans generations. The Paperchase online shop launched in 2010, and in the same year the brand branched out into Jersey and further afield. The customer base of Paperchase is considered extremely highly educated and somewhat left wing; which led to the brand apologising for advertising in the Daily Mail when it was targeted by activist group Stop Funding Hate. It has since moved on to only market into publications with which its key audiences sit happily, and has seen no negative knock-on of the changed strategy in its bottom line. Paperchase’s products range from beautiful to quirky and everything in-between – so no matter the age, occasion or idea you’re shopping for, you’ll be sure to find something you like. Paperchase is a UK based company but has stores on Europe, USA and United Arab States! In was formed in 1968 by two art students – Judith Cash and Eddie Pond. There are over 130 retail points of sale! It was involved in controversy after taking an ad out in the Daily Mail! WHSmith has some great stationery plus some fantastic discounts for students. Amazon of course have a huge range plus a free student discount scheme to get free delivery and promo codes. Check out our Wilko student discount guide for some great money saving tips. Moonpig are always worth a look! Another leading stationary company to look at is Rymans!